Exercising is a word that can bring dread into my mind, I am not a person that always enjoys exercising, I dislike aerobic classes, the idea of jumping around a room getting hot and sweaty with a bunch of strangers just isn’t my cup of tea. For me it is the running machine all the way, but unfortunately, at present it is not possible to include the expense of a gym membership to my budget so I have to find ways to exercise that don’t cost any money. One of my favourite past times is walking: I love just walking but unfortunately I don’t do it enough so I am committing myself to go out more with the dogs. Instead of just one walk a day I am trying to start off my day with a walk with the dogs, even before I turn on my laptop. Housework: I love to clean and it is a form of exercise, you are moving and it can be invigorating as well as therapeutic because you get the pleasure out of having a clean home and knowing that you are benefiting your health through exercising too is great motivation to keep a clean home. Gardening is a great exercising option: it is hard work and rewarding at the same time. If you don’t have a garden where you live there are charities that are always looking for volunteer gardeners, you might be able to find one near to where you live. If you are looking for a free way to participate in an exercise class then you should look at the exercise classes that are available on YouTube. You can pick and choose what you are looking for, I love doing yoga and getting a quick YouTube video of a class is great motivation and tuition on what you need to do. It is also a way to get fit without having to be in a group of strangers, you can do this in the comfort of your home. Look out for free activities that you can do in your area, we are lucky and have a free tennis court that we are able to use, it is right on the sea front so we tend to go there when it is the summer months rather than when it is too cold. Even if you have a park close by there might be some free activity that you can join in. If not, a walk around the park is free too. All these activities you can do even if you have children, there is nothing more fun than spending time together, it doesn’t matter on the activity but doing it together builds family bonds and memories. It also teaches children the importance of having some activity in their day. I loved taking my children out for walks when they were little, they would walk miles and totally loved it and they all still enjoy walking. It is nice to see them out walking rather than wanting to be driven everywhere. Therefore, if you are looking for increasing your exercise levels it doesn’t have to cost you any money, there are ways to participate in exercise without having to worry about the cost. I find that when I join a gym, I spend all my time on the treadmill. 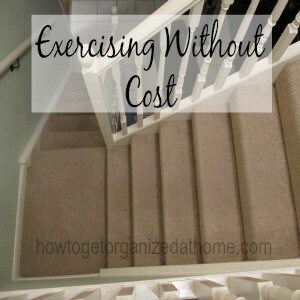 So afterall, we spent more money at one time vs. the long run with a gym membership by buying a treadmill. I love walking. I found that it is also a great idea to spend some quality time with my daughter if we take a walk. It gives us a bit of extra time to talk. I never thought of housework as exercise until I saw how many steps I was taking on my fitbit! Great tips! Thanks for sharing & joining in for Tuesday Talk with us!